If you are creating flat panel designs exclusively then the Pro version is a better choice with the superior sketch and DXF output. The Pro version will have future enhancements. Note: MapBoards can be found in the Create dropdown menu of the Model Workspace. Did exactly what I wanted it to do after about 2 minutes of tinkering to get the settings right. Major time saver for CNC layouts! Fantastic app for all you woodworkers out there running sheet goods and a CNC. Saves me a ton of time nesting panels. This app pays for itself in the first use. For a hobbyist woodworker like me, this plug in is fantastic, and definitely worth US$9.99 even with the current exchange rate to AUD$. I think it's about time we get word spread around the various maker channels about this fantastic product and support this developer so that the updates can keep on flowing! I would love to see one thing added with future development, the ability to add in multiple sheet dimensions for the same type of lumber so that I can use up some of my older offcuts. The only way I can think of doing that would be to make micro differences to material thicknesses, or use different materials for various components, neither of which would be as quick as defining multiple sheet dimensions for a single material type. No joke. This plugin is incredible. Been wanting this for years. If you design boxes-and-stuff to be laser cut... you NEED this add-in! Its only flaw is its name; I believe it makes it harder to find than it should! MUST HAVE FOR CNC ! This just saved me DAYS of flattening mold box panels and projecting dxf's on a large scale concrete casting project. Love the labeling feature as well as it's so easy to lose track of parts when working on complex jobs. Had some issues installing on my machine but got it sorted quickly thanks to some great customer service. Worth well more than the price! Works perfectly almost every time. I have seen a few objects overlap and or extend out of the sheet size area but is always easily corrected. It would be nice if component links were not broken when nested. But overall possibly the most usefull $1.99 I have ever spent. Just one more feature please! 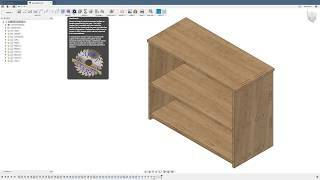 This plugin really makes Fusion a powerful tool for furniture designers, except it would be great to have extrusions which are only cut partly in to components or bodies also be recognised by the sketch output to DXF option. This is key for me to be able to output DXF files as part of a CNC process. Components or bodies that are extruded completely through show up on a cut layer but part extrusions do not. Would this be something you could add in to your software? Everything works smoothly, very happy with the result. Wow. Paid the $2 based on the other reviews, figuring that it won't matter a lot if I was disappointed. I am not disappointed. This add-in is going to save me hours of work when setting up designs for laser cutting. I'm also looking forward to seeing how well it works setting up for a CNC router later as well. Feature request: option to generate a DXF only (no body in the Fusion file). With that said, only having one thing to delete is still a massive improvement! Works great for rectangular pieces - excellent time saver for very little money. Is there a way to "nest" odd shapes for optimized CNC cutting? I was struggling to find a tool that would break down my cabinet designs into plywood cutting plans and this did it perfectly on the first try. I'm with the other commenters when I say this tool is way less expensive than it should be. I'd happily pay $20 as a hobbyist and a pro would likely pay much more. So great! I know nothing of coding plugins, but optimize the handling a bit, so it processes large sheets faster and you have a very very nice tool. Also, raise price to something like 15 dollars. For businesses, this tool could be worth a couple of hundred, easily.. Does exactly what I need to layout panels for my CNC machine. I will literally pay more for this if some extra features could be added. 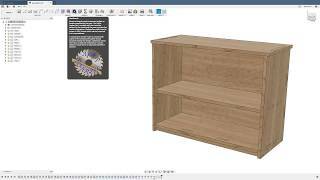 I'm new to Fusion360, want to do my own kitchen cabinets, and was stuggling trying to figure out how to do this. At two dollars I almost didn't go for it, because it had to be a toy at that price, right? I'm very pleased, I may have to go back and fix a couple newbie mistakes on my end but this add on is just flat out awesome. My only comment for those wondering if they should buy it, is to check out a video on youtube. Being a nube at Fusion 360 and plugins, I needed youtube to get started, and then was promptly blown away. Way too cheap for what this is. :) Thank you. Very nice. Makes the workflow a lot easier. One improvement I still have. You could link the parts with jionts in a way that they keep the distance even if the size of the parts change. I know that can wreak havok, if it't not fitting on the plate any more or start overlapping in the second row. I just can't understand why this was necessary and not integrated in fusion in the first place. But there a lot of QoL features that inventor has that fusion would need. But we are not getting them. THIS APP IS SIMPLY AMAZING!!!! I am totally happy with this plug in, really a useful timesaver for me! For further development I would suggest to automatically group all the items generated with the plug in so it would all take only 1 position on a timeline. Then the user could expand the group only if needed. Not really a functional matter, but helps the timeline keeping clean and tidy:-) In previous version I also could not save default values but it seems to be fixed for now. Keep up the great work and thank you! Jan, great suggestion. I'll include the creating of a timeline group for MapBoards in next weeks update. Jan, great suggestion. I&#39;ll include the creating of a timeline group for MapBoards in next weeks update. Sometimes it works fine, but sometimes it positions parts with collisions. Using version 1.4. This app has a great potential and when it's finished it will worth much more than 2$. So now I consider it ok for the educational purposes, as for production, well, 80%. It perfectly suits my needs. Very convenient in use. The developer is very helpfull. (no affiliation, besides that fact that it's a polite and helpfull guy) It would be helpfull if you could save some standard sheet-sizes to select from. (it saves the values you used, but it would be handy if you could do it with 1 selection instead of 2) Highly recommended. Updating works flawless, installation works like a charm too. I just bought this in the pff chance that it would work well. I, until this moment, have been using a program called sketchlist for s few years now. it is cumbersome to design in and the cost is not $2. I installed the plugin and ran it. It worked, perfectly, the first time. I forgot that I made my cabinets in mm and had to convert the stock dimensions. I know it is working with the document measurements, but having the abililty to use whatever measurement would make it a little faster. That is just a little thing though. Thank you for making this plugin, I can finally stop using that sketchlist program and combine all of my design workflow into 1 program. Michael, so glad you fine MapBoards useful. On the input units you can basically type in any unit you prefer including formulas and/or user defined parameters, fractions, etc. Say for example your design is created in mm, which you prefer, and the default units is in inches you can enter a Width and Length in mm by adding the units like this: Width 100 mm Length 200 mm. An updated version, 1.04, will be available today with some bug fixes which you are entitled to download at no cost. Michael, so glad you fine MapBoards useful. On the input units you can basically type in any unit you prefer including formulas and/or user defined parameters, fractions, etc. Say for example your design is created in mm, which you prefer, and the default units is in inches you can enter a Width and Length in mm by adding the units like this: Width 100 mm Length 200 mm. &#13;&#10;An updated version, 1.04, will be available today with some bug fixes which you are entitled to download at no cost. Again, went to use this and now I am seeing so many more enhancements. I still cannot believe the price for the functionality. This is a must have for CNC users. It is the only plugin I have been 100% happy with. The OBJ exporter is $50 and it does not even do it right. Well, not all of the time at least. But this one works as I expect every time. Thanks again for making this!